Users can add banners to your rotator for themselves thru the User Control Panel. But as an administrator, you can also add banners to your rotator easily. You will need to click the Banners icon, shown circled to the left. Please note, this is in the TOP section of your Control Panel, not the lower Admin section. Clicking this link shows you, or your user (who ever is logged in) what banners they currently have displaying in the rotators. It displays the Loc, which tells you in which area the banner displays (top of the page, and bottom of the page, respectively). The Url is where a visitor is brought if the ad is clicked. Impressions tells how many times the banner ad has been displayed. Clicks is how many times a visitor has clicked the banner ad, and Expiry is when the banner will be deleted from your site. To place a new Top Banner, you would click the 'Purchase top banners credits'. And to place a new Bottom Banner, you would click the 'Purchase bottom banners credits' and so on for each of the banner/ad zone options. You will need to follow the instructions on the next screen in order to complete your purchase and submit payment in advance for the banner ads. Admin accounts come with banner credits already stocked into the user account so you can add your banners without payments being made. Next return to the Add a Banner screen and you can now select to order your banners and credits will have been applied dependent upon how many advertising months you have purchased. Once you have clicked the choice for either adding a top or bottom banner, you will see a form similar to the one on the left. The Banner Type option allows you to select between uploading a banner from your computer to the server and adding a 'click to' or Destination Url. This is the easy way to add banners if you have little or no HTML experience. To use this option you can simply leave the option 'Use banner image and URL' checked as shown below and to the left. You will use the Browse button shown to the left to search your computer's hard-drive for the image you wish to upload for the Banner Image. However, our banner system allows for User's to use more advanced options as well such as affiliate codes (Linkshare, Commission Junction, etc) and Flash code. To use these types of banners, you need to toggle the option above to read 'Use custom HTML (for Flash ads or remotely-hosted banners)'. Once you have changed the option, you will see an image that looks much like the one to the right. Here you can insert any HTML or flash code needed into the Banner HTML fields. NOTE: If you choose this option, please understand your HTML code and flash banners must now contain the 'click to' or Destination Url and must also be coded to open in a new window if so desired. Flash banners must have both of these functions built into the flash file itself. And finally, you select how long you wish the banner to display. Note: Remember, each banner credit is good for 1 month.Example: You have 15 banners, each of which is valid for 1 month. If you wish to run a banner for several months, you can combine banner credits and use the drop down bar to select 15 months now. 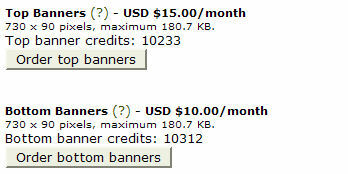 Or, you could either create 15 individual banners for 1 month each! Now the banner is being held for activation, unless you selected the option to automatically approve images. If not, you will need to login to the Administrator's Banner management and activate this banner. After clicking the Banner Creator link, in the User's Banner Area (remember, this is in the User Banner area in the TOP section of the control panel), you can choose a blank banner template but clicking the circle below the Choose option to the right of the banner image. This will be the foundation upon which your new banner will be built. Once you have selected your image, click the Continue button at the bottom of this page. Enter the name of your company and your slogan (or other information). Next, choose a font and color for the name and slogan. Next, decide where on the banner you would like the name and slogan to appear. The numbers in the 'Left' and 'Top' fields determine where the top-left corner of the text will appear on the banner. (Increase the 'Left' value to move the text to the right; increase the 'Top' value to move the text down.) You can see how we toggled the numbers around to create the image pictured here. It is just a few minutes of trial and error, but the end result is fantastic! To preview your changes, click 'Update Preview'. When you're satisfied with the result, click 'Accept Banner' to download your completed banner. This image must be saved to your computer before you can use it in the Banner Rotator.